"Fully developed. Very good body construction and a far reaching gait. Appears to me today to be of a dry type of heading dog, but however, somewhat over heavy and therefore does not show in the long gaiting the energy or endurance of a herding dog. One premolar missing." "... very good in structure, but, for his age, very big and heavy." "Reserve Sieger in 1937 was Odin v Busecker Schloss a light grey sable fractionally taller and much heavier than Pfeffer (v Bern) (24 in, 88 lbs.). 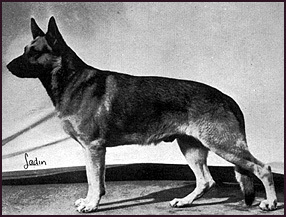 He was also by Dachs v Bern and inbred 5:4:3: on Klodo v Boxberg A very powerful long dog with an outstanding strong back and a gait that was filmed for future generations of breeders to gloat over, Odin had a steepish upper arm but a well laid back shoulder with a long humerus. He had good feet, croup and stifle with a temperament bordering on the aggressive. One premolar was missing. Owned by the Villa Marina kennels he reversed the Sieger awards in the States and retired from the ring in 1942 undefeated in the breed in America. His stud record was less impressive than Pfeiffer's but he suited Pfeiffer 'blood' and in the main gave good middle pieces and strong backs with good transmission but some missing teeth and inevitable colour paling in view of his own colour. Like Pfeiffer he was ROM and like him is regrettably not really to be found in British pedigree."